Lief Erikson is regarded as the first European to set foot in North America. While that might not be entirely true, according to The Greenlanders Saga, he did establish the first European settlement there, 500 years before that old media monopolizer Christopher Columbus hitched up his sails. On his voyage in 1002, Leif first stopped on a rocky island he named Helluland (Land of Flat Stones), which is probably Baffin Island, Canada. Next he checked out a flat and woody area he called Markland (Wood-land) before settling in the famed Vinland. He named the settlement, Liefsbúdir which poetically translates to “Lief’s Storage Houses”. It would seem from this name that Leif did not intend this to be a permanent settlement, but he did stay for the winter and return to Greenland in the spring with a cargo of timber and singing the praises of a land of wild grapes, abundant salmon swimming in the river, mild winters and year round green grass. The actual location of this idyll is still hotly debated more than a thousand years later. The salmon-teeming rivers would not have existed south of New Brunswick, and wild grapes do not grow as far north as Newfoundland. So the whole package couldn’t have really existed all in one place. But we do know that Leif’s father, Erik the Red sold settlers on moving to a new locale from Iceland by naming it Greenland to evoke images of verdant pastures filled with grazing livestock and fertile cropland, even though that only pertained to a small coastal area of an otherwise frozen tundra. So it is likely that the father taught the son that good marketing is the life blood of any successful colonization project. 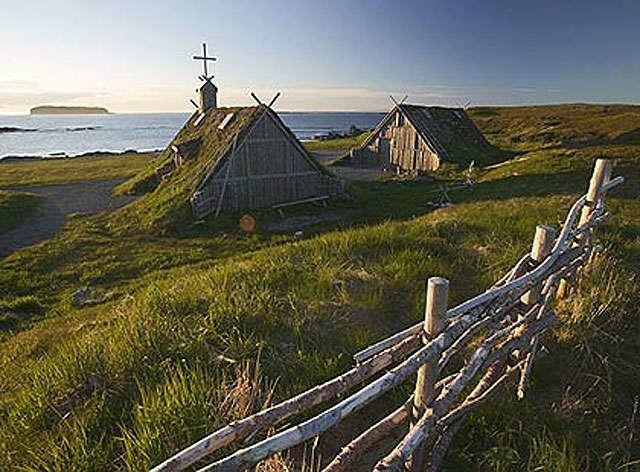 A Norse settlement from that era has been identified on the northern tip of Newfoundland known as L’Anse aux Meadows, which could be Liefsbúdir, if it is in fact a home base from which further exploration took place. The colony only survived about 15 years, when it was abandoned after conflicts with the native peoples became too troublesome. 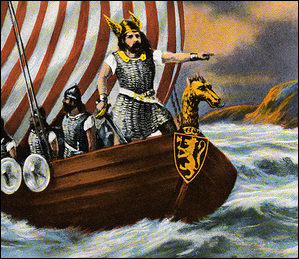 Leif Erikson Day (October 9th) is an American Holiday that honors the contributions of Americans of Nordic descent. Lief’s heritage encompasses the overall Nordic region fairly comprehensively as his grandfather was Norwegian, but had to flee to Iceland due to man-slaugter charges. His father, Erik The Red, followed in the family tradition and was exiled from Iceland for three years for murder, which he spent exploring Greenland. And Lief lived in each of those countries before embarking on his Western Journey to Canada. His Day is a celebration of Scandinavian Heritage, much in the way that St. Patrick’s Day or Cinco de Mayo celebrates the Irish and Mexican in each of us. In my extensive research of Scandinavian-American culture (listening to News From Lake Wobegon on NPR) I feel qualified to make the gross generalization that they are a less boisterous people than the Irish and Mexicans among us. A certain Calvinist modesty perhaps has kept them from promoting this holiday with the same zeal. Or maybe it is just because Scandinavian liquor like Aquavit is harder to come by than Guinness or Jose Cuervo. I think a Viking spirit of exploration is something to be celebrated on this day. While I know that an errant early October snowstorm is not unheard of in parts of the United States, there’s a good chance the weather will be autumn perfection on October 9th, and a good explorer would want to take advantage of such conditions. Search out some new (to you) hiking trails in your area, pack a picnic of Scandinavian Delights and trek out to discover your local grassy meadows, and salmon streams. From my thorough study of this regions culture (Reading Steig Larson’s Dragon Tattoo Trilogy) I have gleaned that coffee is an integral part of Scandinavian hospitality and social interaction. (The top six coffee consuming countries of the world are Scandinavian: Finland, Norway, Iceland, Denmark, Netherlands and Sweden. The U.S. is all the way down at number 27). This isn’t really surprising considering how much coffee I would need to get through days with 20 hours of darkness. So pack a thermos of coffee to enjoy with your snacks and offer to your fellow revelers. No self respecting Scandinavian host would be caught without a fresh cup to offer to a friend. It is important to note that these are not gigantic Dagwood-type hoagies. A sandwich in Nordic culture is most often a small snack, usually one piece of bread with butter and another topping like pickled herring or cheese and cucumbers. We might call this a canapé if we were being fancy. A typical Swedish party would have a smörgåsbord consisting of many different types of open sandwiches. 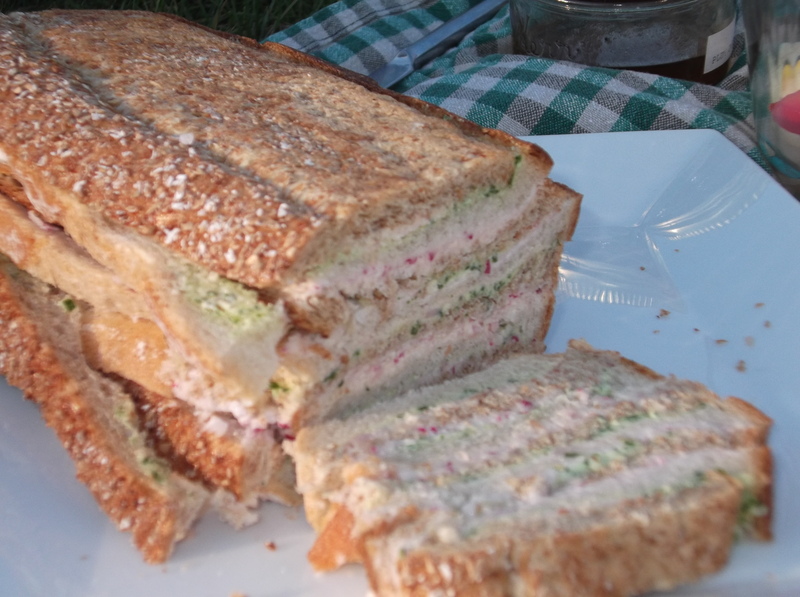 For the purpose of a picnic, a bunch of open sandwiches would be difficult to manage and messy, so a fun alternative is the Striped Sandwich, which behaves like a closed sandwich with a top and bottom until it is sliced, then you have a beautiful, thin, open sandwich. It’s important to get really wonderful bread for this sandwich. See if there is a good Scandinavian Bakery in your area. It’s worth the special trip. Meat Butter (Köttsmör) How can you not love the term “meat butter”? Mix the butter with the meat. Cream until smooth. Add horse-radish and cream if desired. Mash the blue cheese very thoroughly or sieve it with the cream cheese. Beat the mixture until smooth. Whip the cream and fold it into the cheese. Flavor with radishes and celery salt. Alternate: Flavor with tomato purée, French mustard and a little lemon juice instead of radishes. Spread the fillings evenly (and thickly) on the bread and pile the slices on top of each other, alternating the light and dark slices. Do not spread any filling on the outside of the top slices. Press the sandwiches together and wrap in aluminum foil. Place the sandwich in a light press, such as between two cutting boards and set aside in a cold place, like the refrigerator, for at least two hours. Trim the edges of the sandwiches and cut it into 20-25 thin slices. Each slice may be cut into two triangular shapes. I think it is best to bring a bread knife (packed safely) and slice your sandwiches on site. When I think of Scandinavian Design, I think of clean, simple lines, and beautiful bold colors. I think with the long dark winters, there is a need to bring brightness into life in as many ways as possible, and to celebrate the long, bright days of summer when they seem far away. For this reason, I used multi-colored heirloom tomatoes in this salad. Not only are heirlooms the most flavorful tomatoes in my opinion, but this simple, colorful salad looks like a bright, Norwegian kitchen to me. Cut the Tomatoes into slices or wedges. 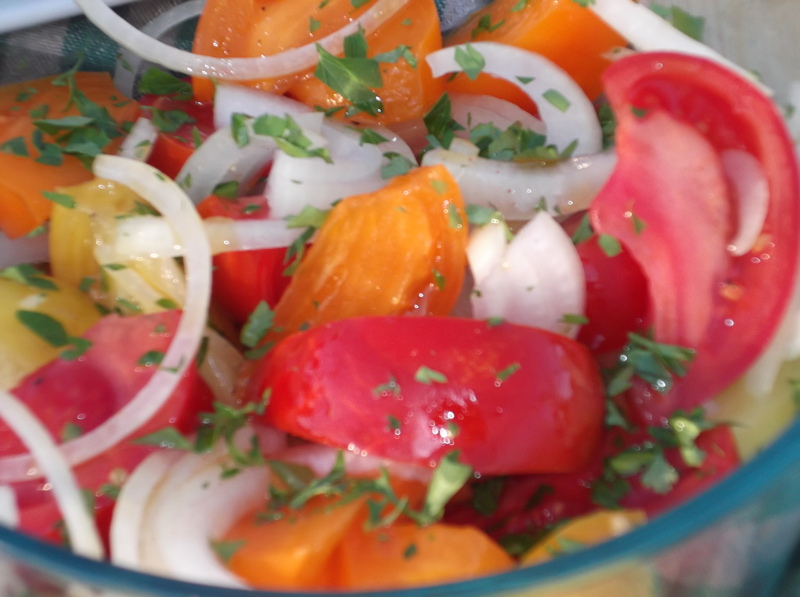 Pour viniagrette over tomatoes and onions and sprinkle with herbs. 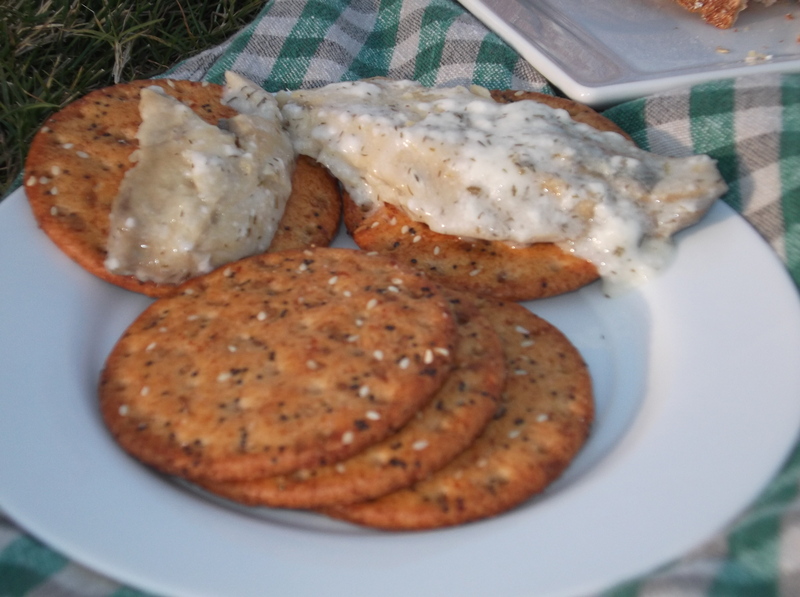 I’m sure you can spend a long time cleaning and pickling your own herring, and making a fancy sauce, but judging from the number of options at the Swedish import market where I bought the tin of Herring in Dill Cream sauce, I think the tin is very popular in Nordic lands, and a great way to transport the snack for a picnic. I had wanted a whole herring for a recipe for Talk Like A Pirate Day, and I called numerous seafood departments of supermarkets as well as Jewish Deli’s and no one seemed to have it, or know where to find it. Sometimes it is best to keep it simple. A picnic adventure is more about the picnic and adventure and less about slaving in the kitchen to prepare. Dill is considered the Scandinavian Herb. The old Norse word “dilla” meant to lull or soothe, and it was used a remedy for colic and upset stomachs. Dill is the essential ingredient that distinguished Scandinavian Gravlax from other culture’s smoked salmon. Havarti is a Danish, semi-soft cheese. It was created by Hanne Nielsen on a farm north of Copenhgen in the mid-19th Century. Or celebrate Vinland’s salmon streams with a Salmon and Cream Cheese Sandwich with a little sprig of dill. Lingonberry Jam in Sweden and other Nordic countries is like grape jelly in the U.S., a staple item. But they are also a popular wild picked fruit in the Canadian Provinces of Newfoundland adn Labrador, which must have made Lief and his companions feel right at home. Lief called the place he discovered Vinland because of the abundance of wild grapes he found growing there. I think it is ok to forage for them at your local farmer’s market or even supermarket. 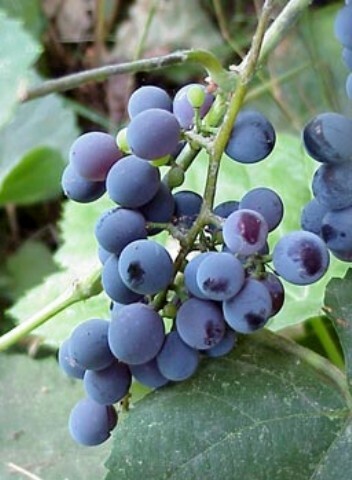 Grapes are fantastic way to stay hydrated and keep your energy up on a long hike. Plus they dress up a plate in a snap, and look beautiful next to almost anything. Clean and rinse the berries. Sprinkle the sugar between layers of berries in a pan and heat the mixture slowly. Cook the the berries until tender and some of the water has evaporated. 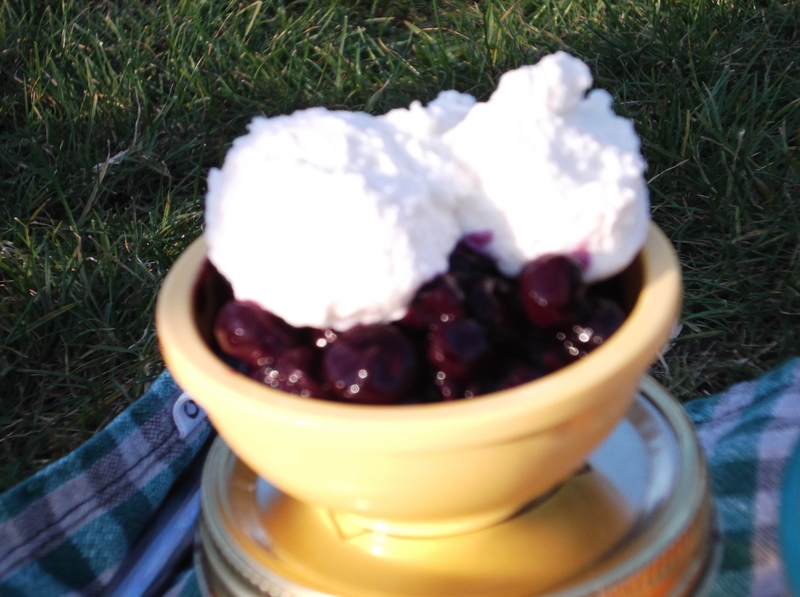 Pour the compote cold with vanilla whipped cream.